The PC-610 Perfect Chair by Human Touch is truly a relaxing and comfortable recliner. 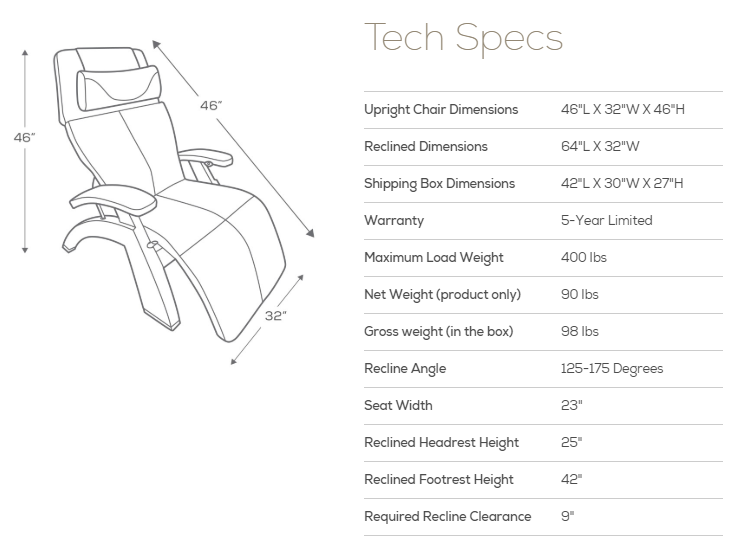 Listed below are some of the amazing features of the PC-610 Perfect Chair. The Armrests are extended for extra comfort and support. Their are various leather and wood stain colors to choose from when purchasing the PC-610 Perfect Chair. A Jade Heat Kit can be added to the padding of the Perfect Chair for relaxing heating features. This model comes with a full support head pillow, which allows for extra neck support while reclining. Need further assistance with the PC-610 Perfect Chair or any of the other amazing recliners we have listed on our site? Call 888-486-9463 to speak with a Human Touch Recliner Specialist. They are available to answer any questions and help find the perfect color and model for any home, office, or living space. Human Touch® products are backed by limited warranties against defects in materials and workmanship. The information provided here is an overview of the warranty program. For specific information related to your product, contact Human Touch Customer Service at (800) 355-2762 or e-mail csadmin@humantouch.com. Warranty coverage begins at the time the Consumer purchases the product, and is non-transferable. Warranties are only valid within the United States and Canada, provided the equipment has been operated according to the instructions accompanying it. The warranty only applies to the product and does not include any accessories or enhancements. All Human Touch-authorized shipments that are delivered in original, new packaging are warranted to be free from defects in parts, materials and workmanship. The following warranty terms supersede any previous terms listed in Use & Care manuals for products purchased on or after May 15, 2014: Perfect Chair Omni-Motion Warranty (purchased after March 1, 2018) PC-610, PC-420, PC-600, PC-LiVE- 5 year In-home service, 5 year parts, 5 year structural warranty. Warranties do not cover any loss or damage resulting from: improper installation; unauthorized repairs; alterations or modifications of original condition; improper use of electrical/power supply, loss of power; electrical disturbances and power surges; dropped product; a malfunction or damage resulting from improper or unreasonable use or maintenance; failure to follow operating instructions; transportation damage; theft; abuse; misuse; neglect; vandalism; or environmental conditions (fire, floods, rust, corrosion, sand, dirt, windstorm, hail, earthquake, or exposure to weather conditions); loss of use during the period the product is at a repair facility or otherwise awaiting parts or repair; and products purchased from unauthorized dealers. Damage incurred due to shipping and handling does not constitute a defect under this warranty.